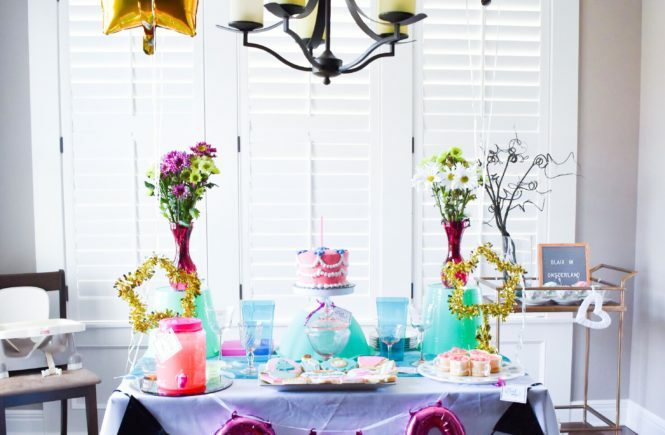 I came across the Alice in ONEderland Birthday Party theme on Pinterest [of course! 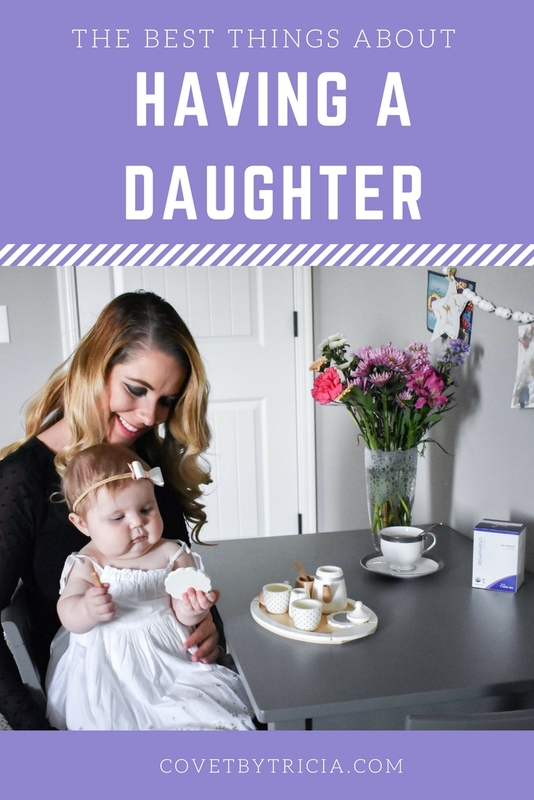 ], and I thought it would be perfect for our little princess. 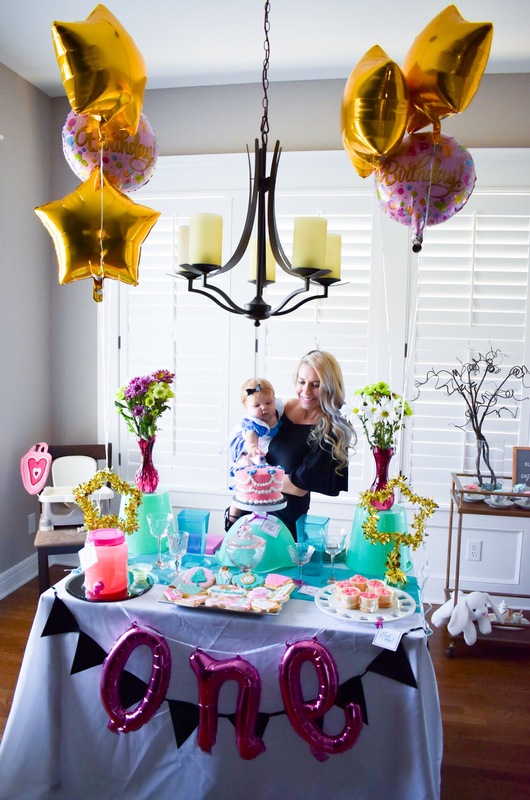 We decided to have a small family-only party for Blair’s first birthday, seeing as how she doesn’t have many friends at one year old. 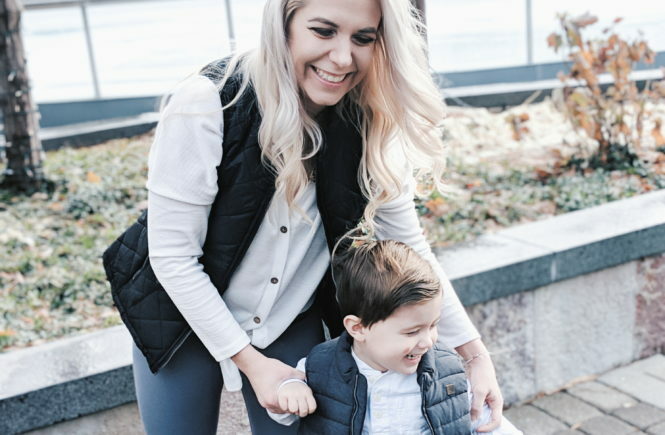 My husband and I are both only children, so there aren’t many other kids for her to play with in the family other than Colton, of course! 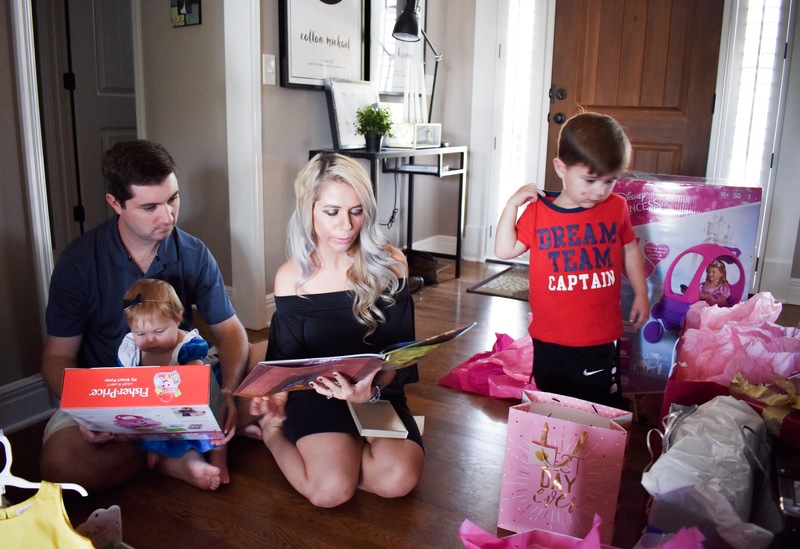 That’s actually a big reason why we wanted to give Colton a sibling–so he won’t be the only kid at family gatherings. 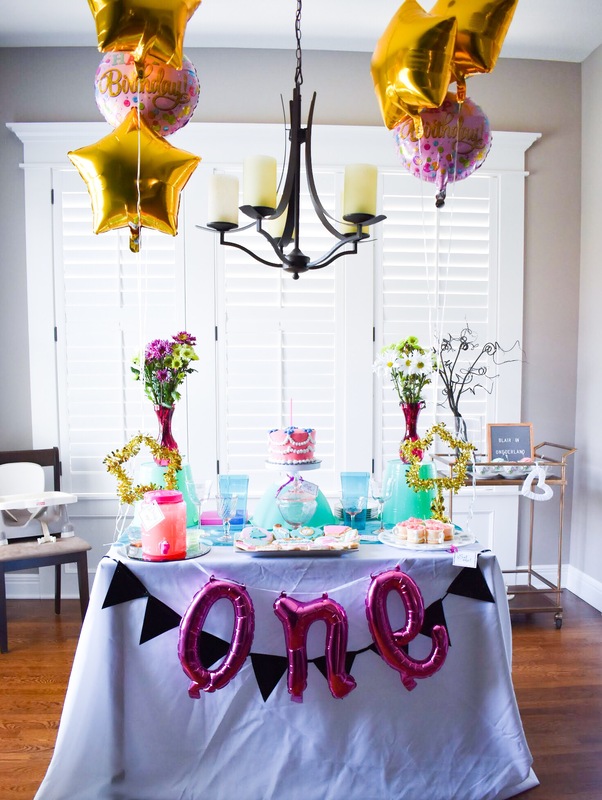 Balloons are a great way to add height to your Alice in ONEderland Birthday Party table. 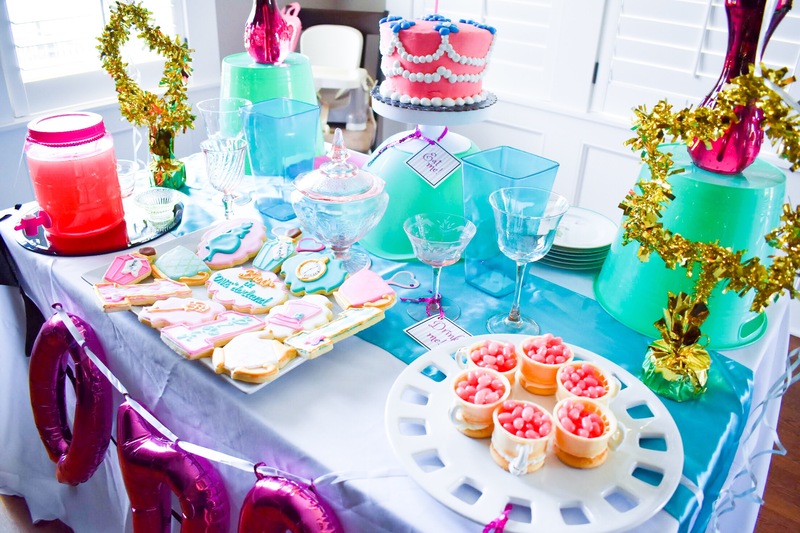 The biggest tip I have for decorating party tables is to vary the height of items placed on the table. 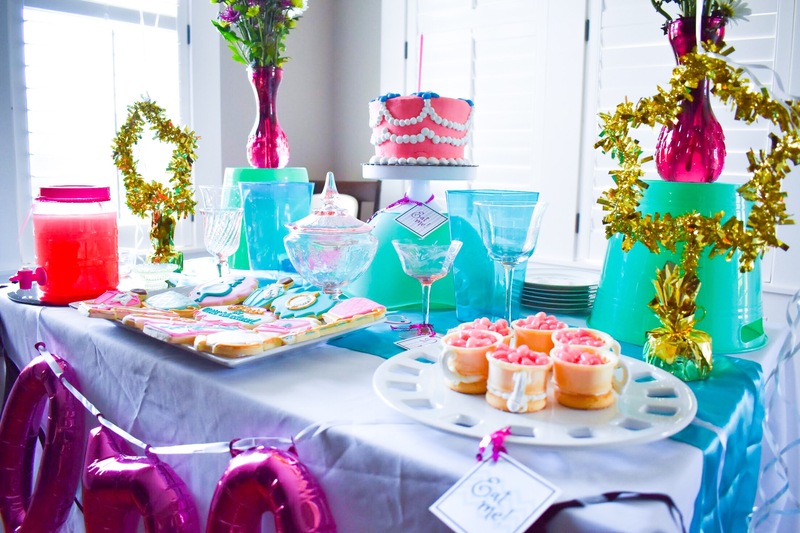 Having everything flat on the table looks amateur, but add in a few height variations and guests will think you’re Martha Stewart. Ha! Get creative with how you change up the height, too. For example, I turned a couple buckets and a serving bowl upside down to add some height to this table. 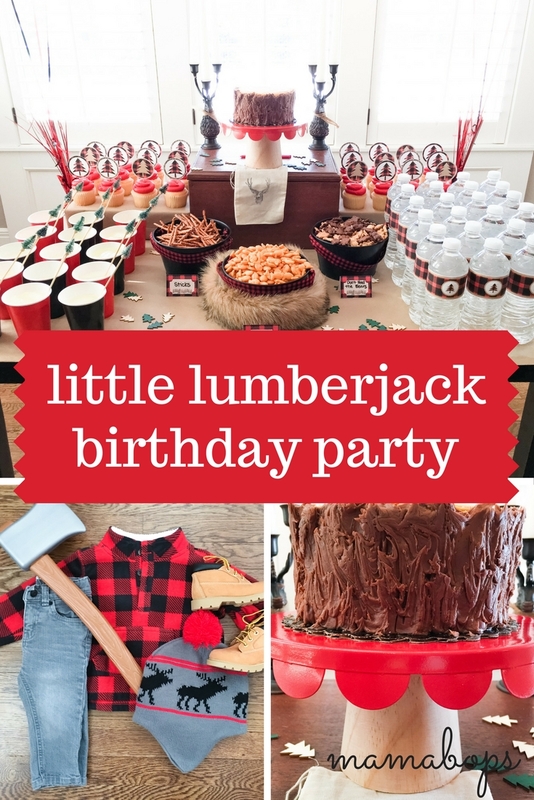 In the past, I’ve used cardboard boxes covered in wrapping paper to match the party theme [like at Colton’s Little Lumberjack Birthday Party]. You can also use a stack of books to create height. 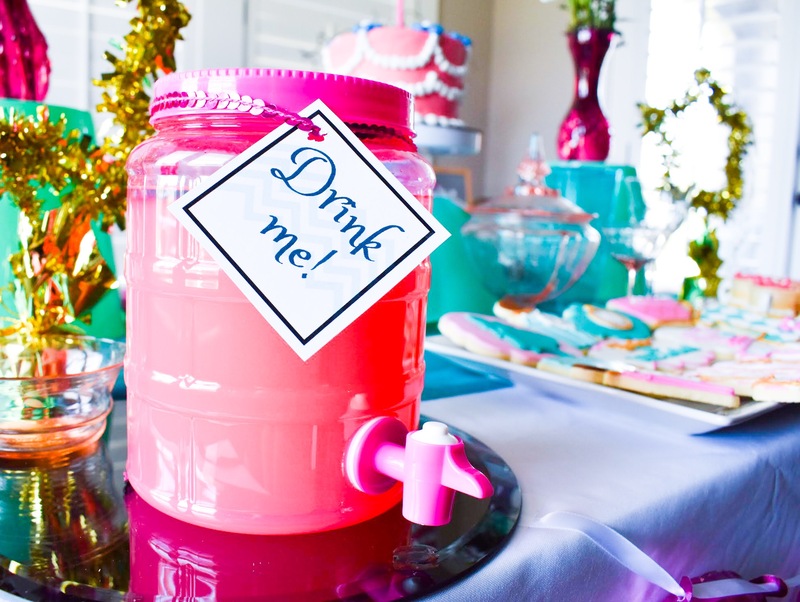 Look around your house for items you can temporarily repurpose for the party. Eat Me and Drink Me signage pays homage to the signs Alice encounters on her adventures in wonderland. 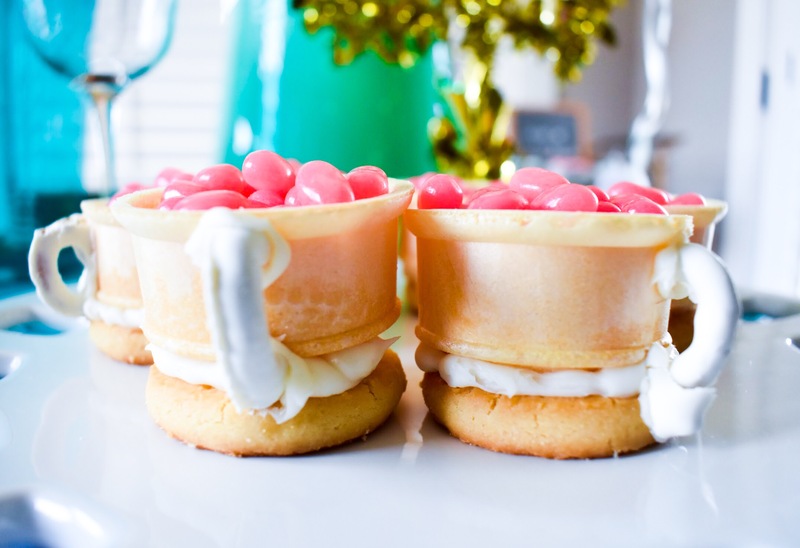 The goal was to create an Alice in ONEderland tea party theme, so Colton and I made these “teacups” out of cookies, ice cream cones, a piece of a yogurt-covered pretzel, and icing. 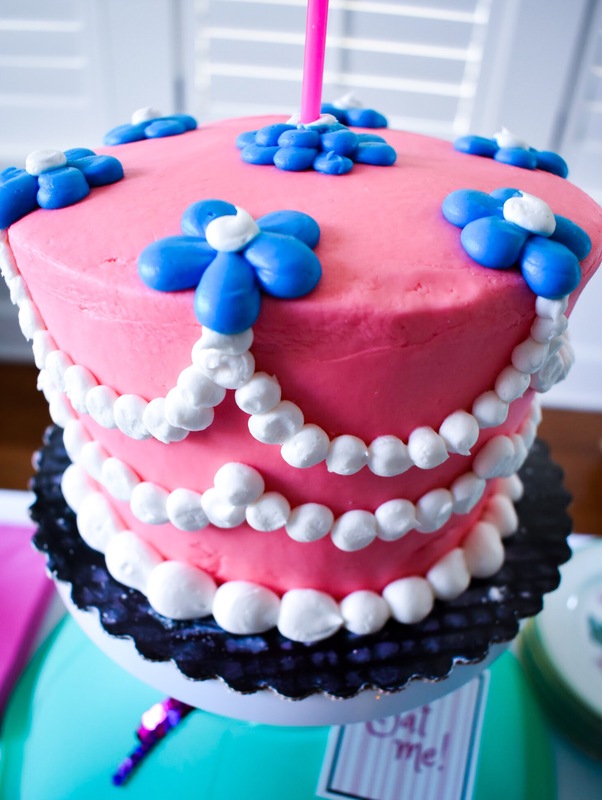 They’re filled with jelly beans to match the party colors. 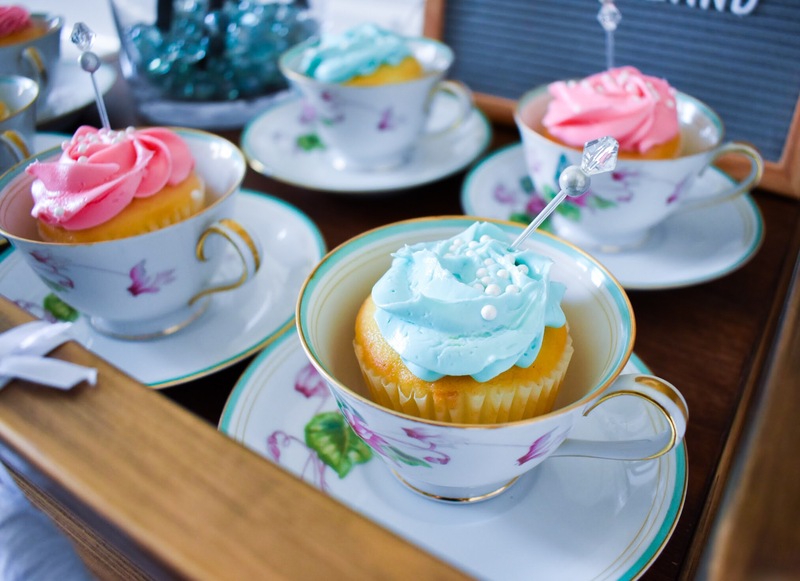 Cupcakes for the guests were served in teacups, to continue with the Alice in ONEderland tea party idea. 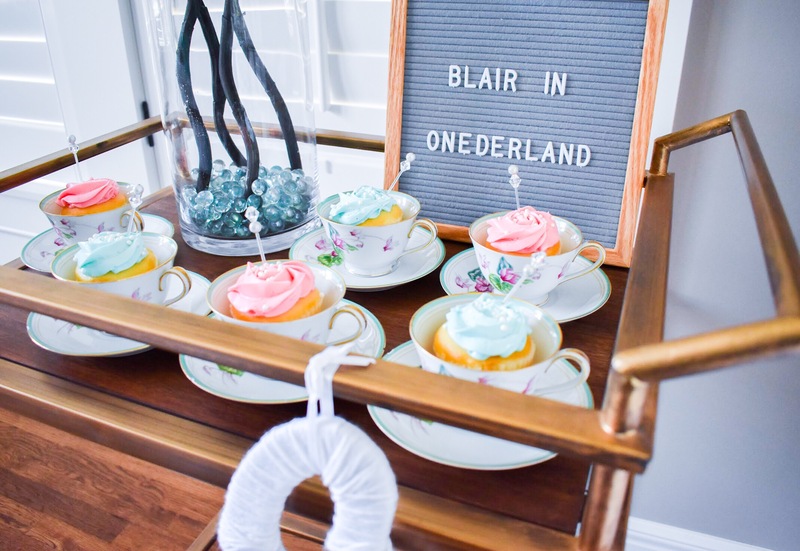 This china just happened to be a perfect match for Blair’s birthday colors. My mom and I actually found it at a garage sale a few years ago! Someone was selling off an entire set of it for around $10. Crazy! 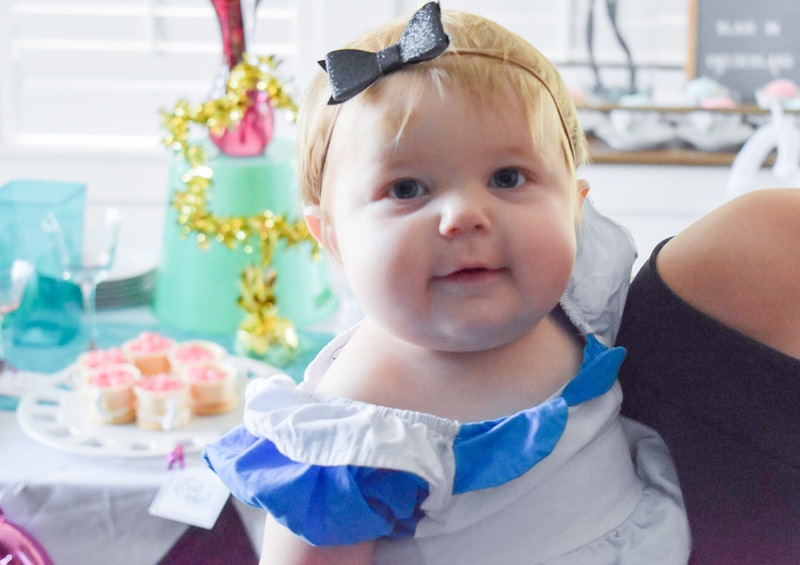 Our birthday girl wore this cute baby Alice in Wonderland costume to fit the party theme. It’s China sizing, but for reference, she wears a size 12-18 months normally and wore a size 90 in this outfit. 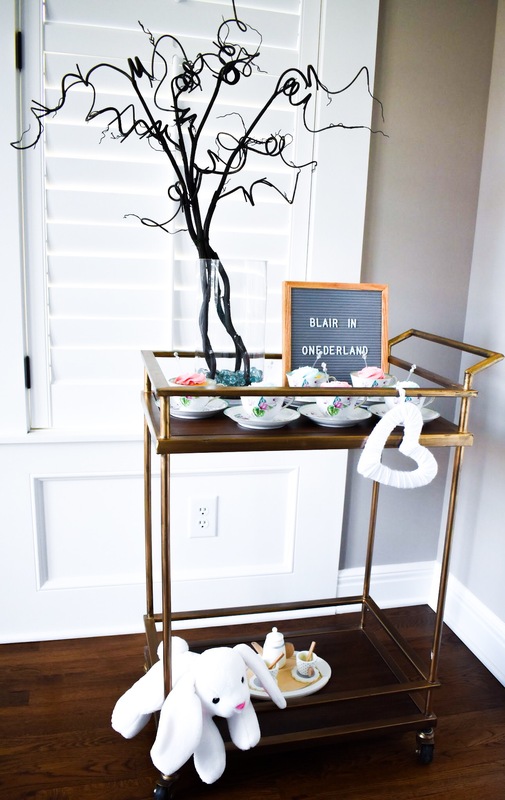 Funny story, I went into Disney Store at the mall a few weeks before the party just to see if they had any Alice in Wonderland birthday party supplies, costumes, whatever. There was a display of baby costumes for Snow White, Cinderella, etc., so I asked the lady who worked there if they had anything similar with an Alice theme. She laughed at me! Well, OK then. I happen to think Alice is pretty cool! And I’m guessing this $20 dress I found online was much more affordable than anything they would’ve sold at Disney Store anyway. 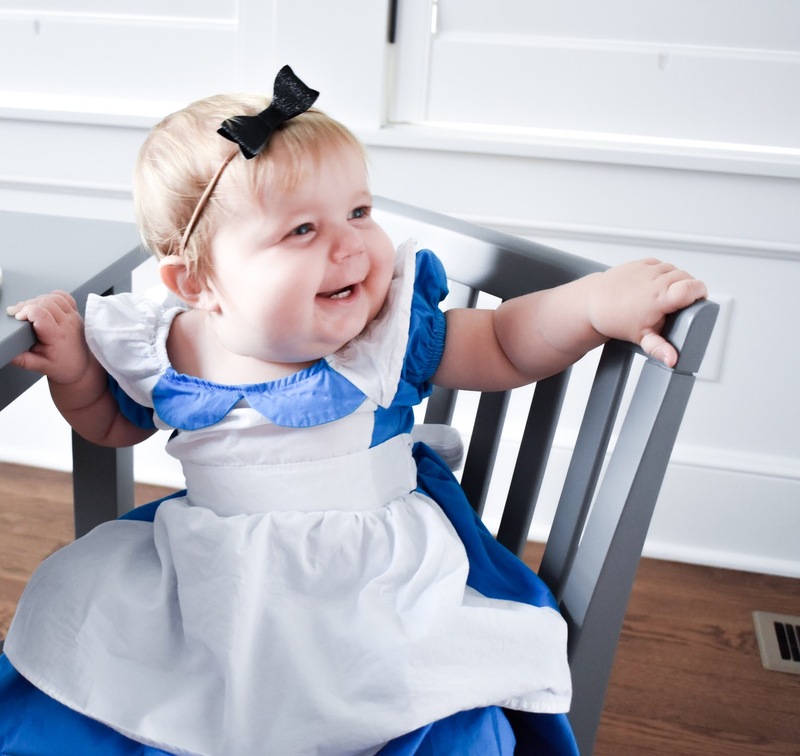 We also had her wear black mary janes to match the real Alice in Wonderland outfit. I spared her the white tights because, well, no one wants to put tights on a baby. 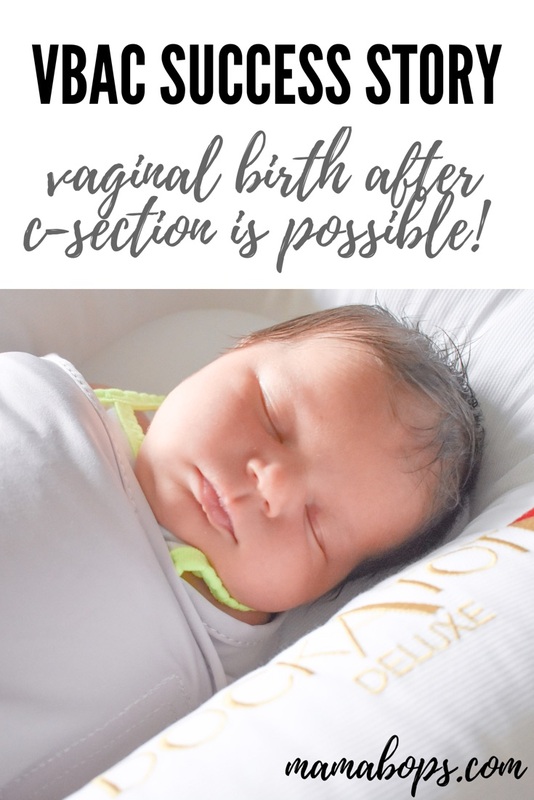 That just sounds terrible. 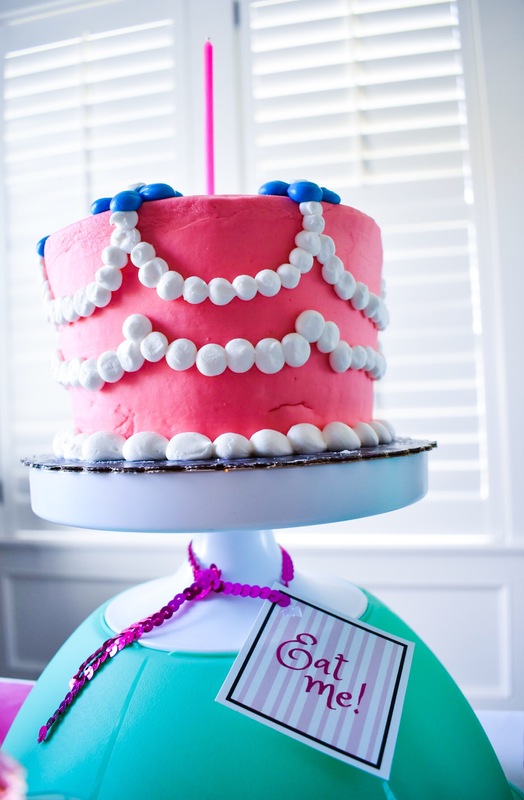 Blair’s smash cake was a replica of Alice’s unbirthday cake. 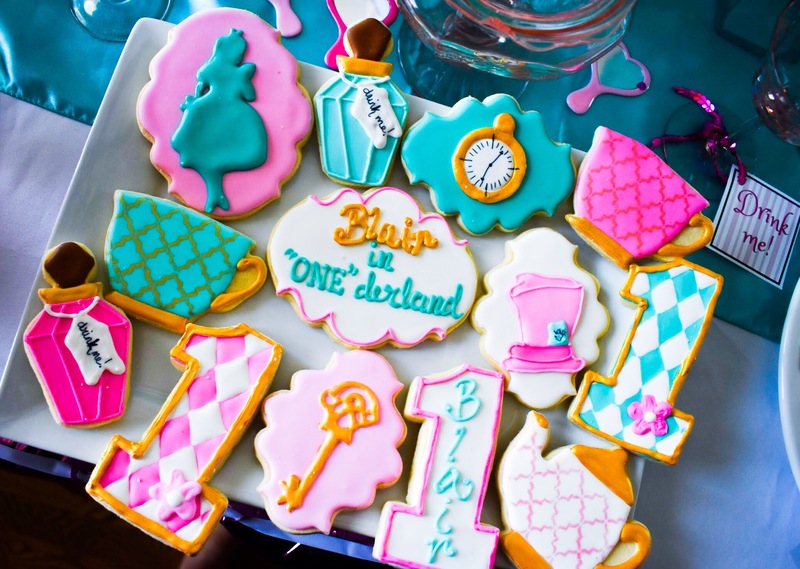 These custom Alice in ONEderland birthday party cookies were probably my favorite party detail. 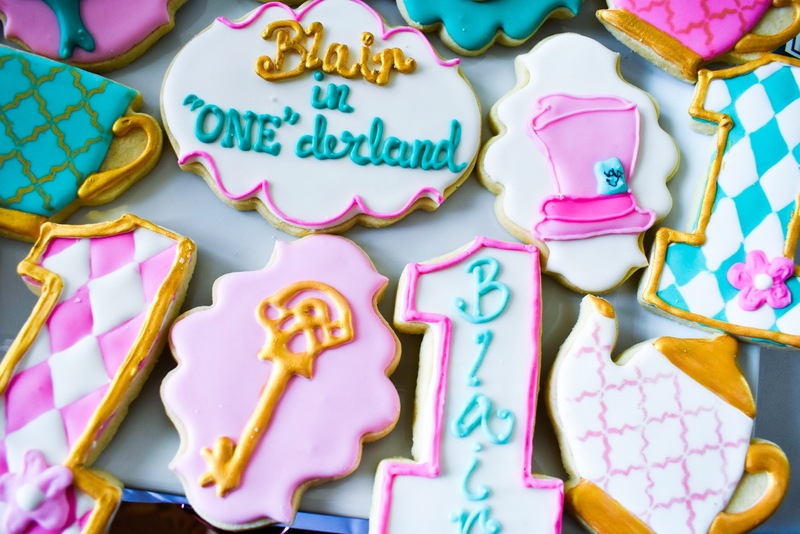 I’ve never done custom cookies for a party, mainly because I like to DIY my party details and these types of cookies are way out of my wheelhouse. 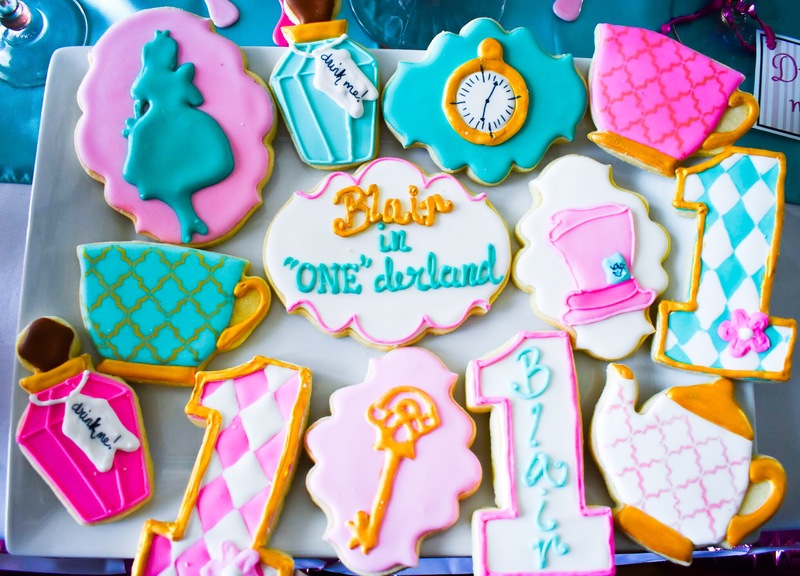 I saw so many cute first birthday cookies on Pinterest, though, that I couldn’t help myself. Nor can I help myself from digging them out of the freezer and eating one every couple of days. 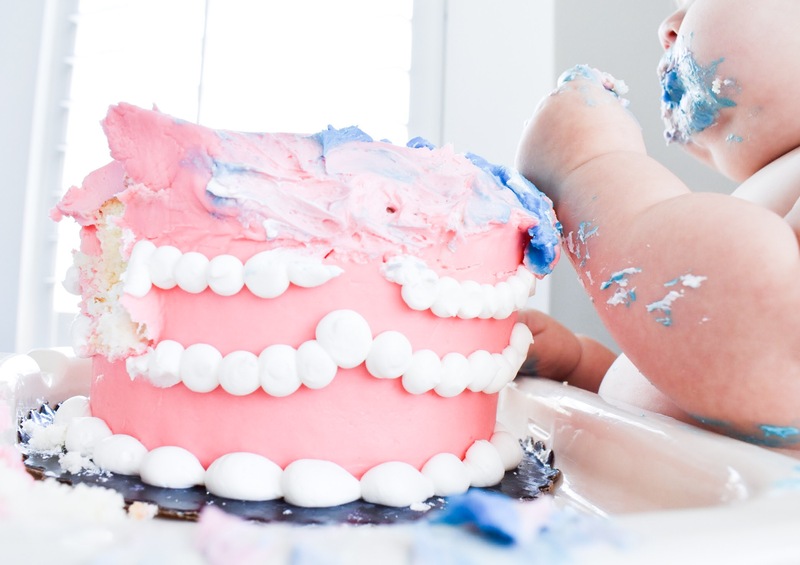 Blair really tore into her smash cake! No surprise there, she loves food. 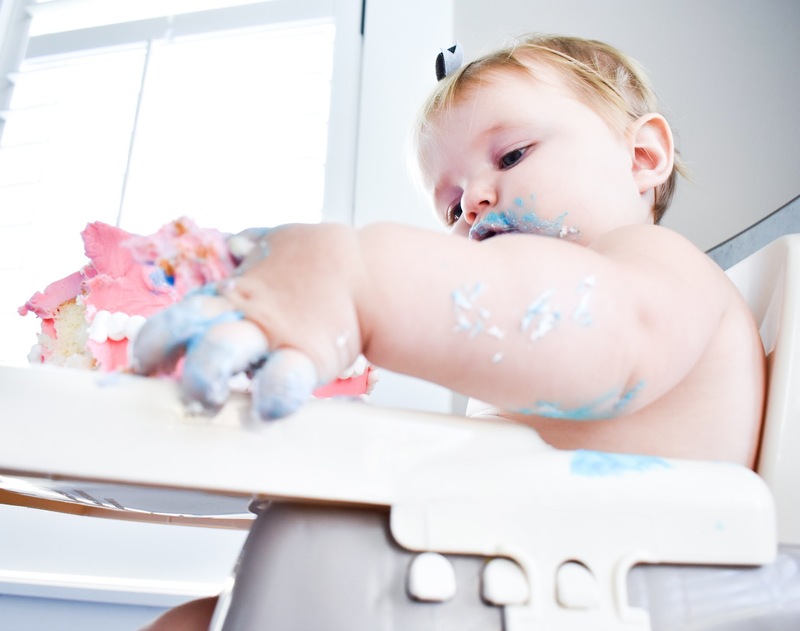 One of my favorite things to post on my Instagram Stories is all of the crazy foods Blair eats [and her messy face afterward…!]. 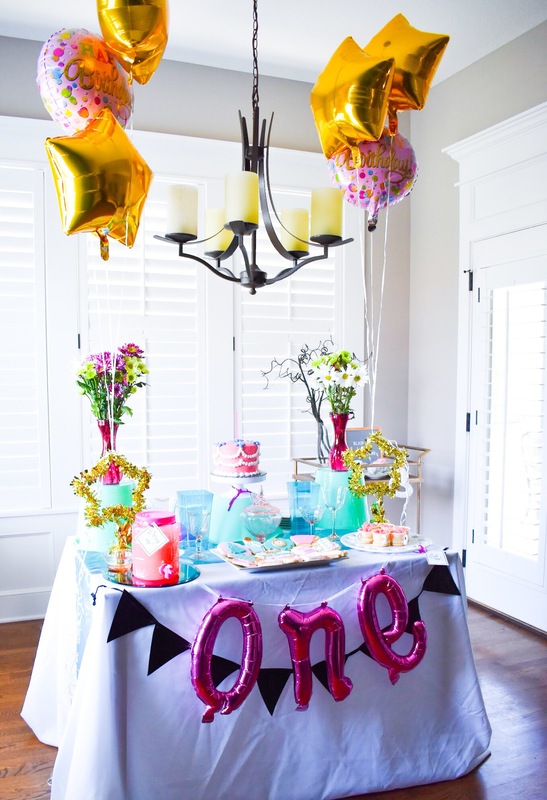 I see a lot of Alice in ONEderland themed birthday parties doing red and black as the color scheme, similar to a deck of cards. 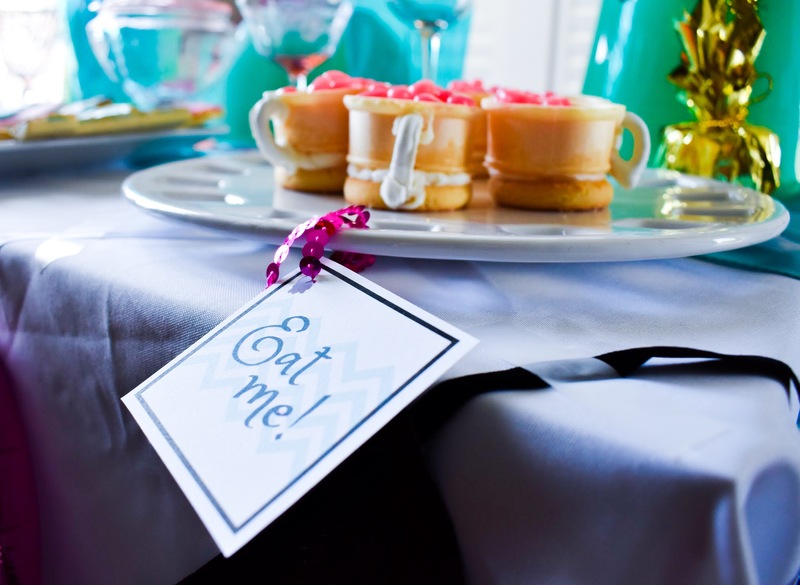 That was actually what we were going to do at first, until I found these invitations and fell in love with them! 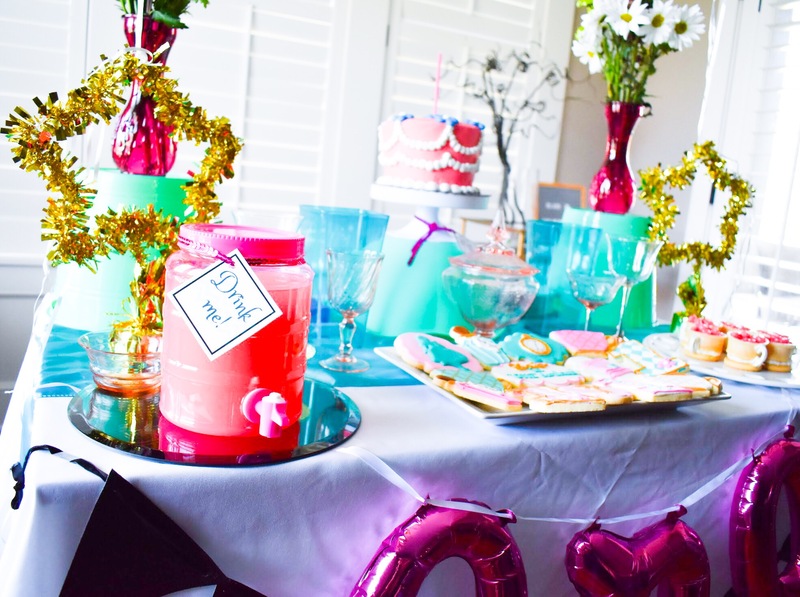 Plus, I thought the pink and teal would be more fun and upbeat for a summer party. 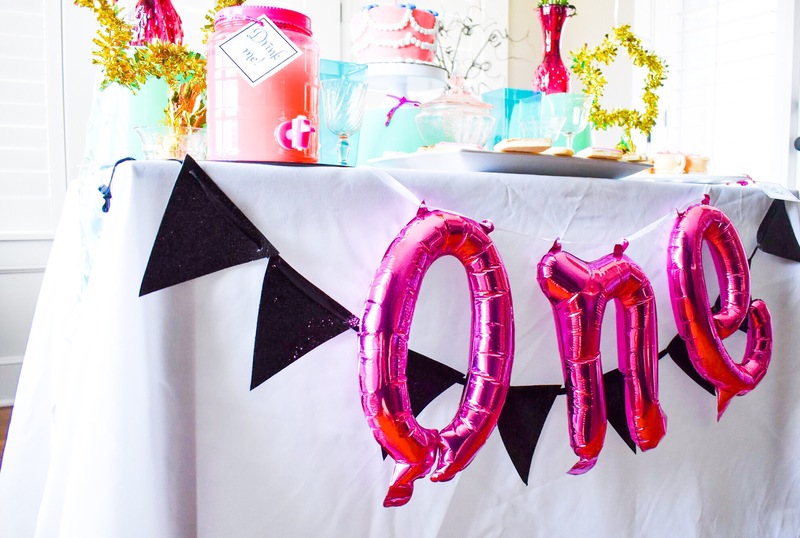 Letterboards are a great way to add decor to any party! 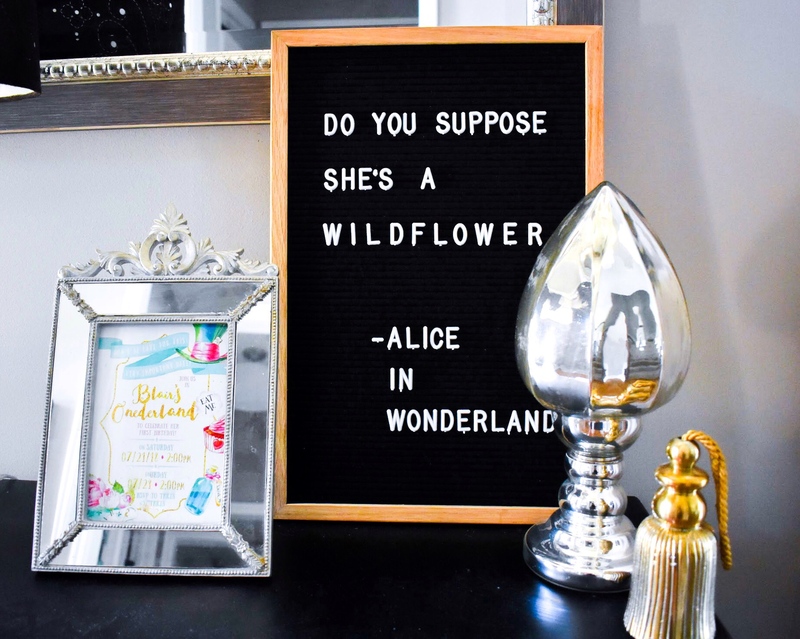 I just Google quotes based around the party theme and pick a couple I like to put on our letterboards. 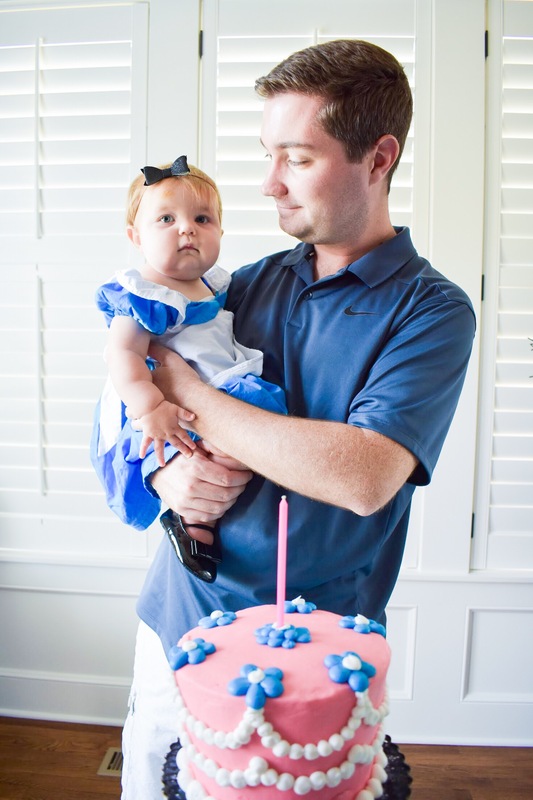 One of our gifts to Blair was this hardcover Alice in Wonderland book. 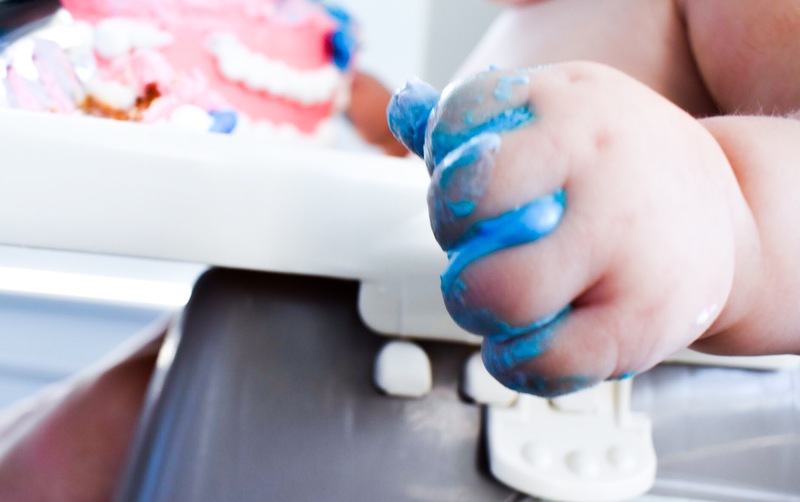 It’s obviously advanced for her at this point–I’m thinking she won’t be too interested in it for at least a year–but I wanted her to have a nice keepsake from her first birthday party. I looked at a lot of Alice in Wonderland books online [seriously, I didn’t realize there were so many!] and I really liked the illustrations in this one. Plus, the length is kid-friendly… I didn’t want a novel that she wouldn’t be interested in reading for a decade. Our big gift to her was a Bitty Baby doll. I loved the American Girl dolls growing up, so I’m hoping Blair shares that same love. My collection is actually in our basement! 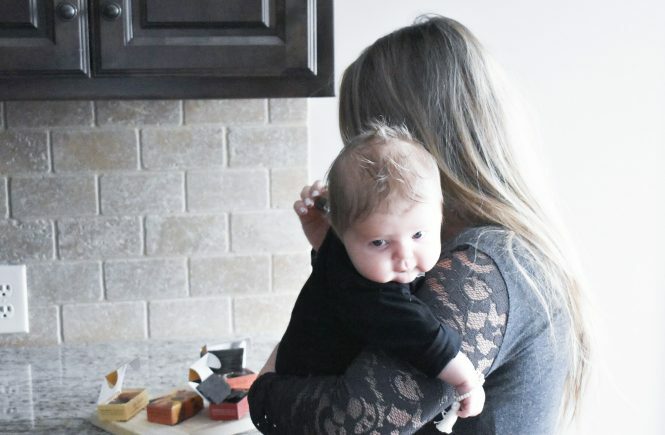 I’m honestly surprised how much Blair loves her Bitty Baby. 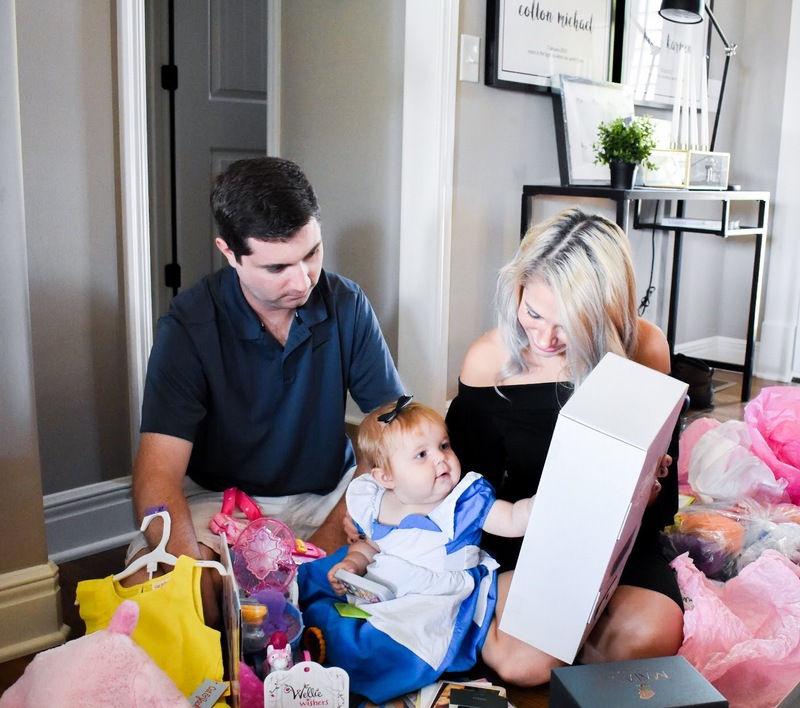 I wasn’t sure if Bitty Baby is a good birthday gift for a one-year-old, but she’s played with every day since her party. She likes to hold and cuddle the baby and holds up outfits for me to change her into. 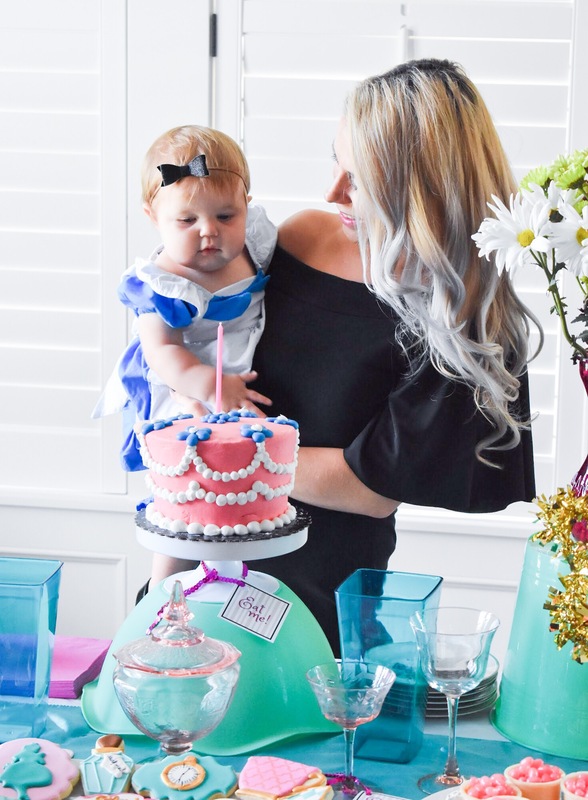 I’ll include sources for our Alice in ONEderland birthday party below. Please feel free to leave a comment or get in touch if there’s anything you have a specific question on. 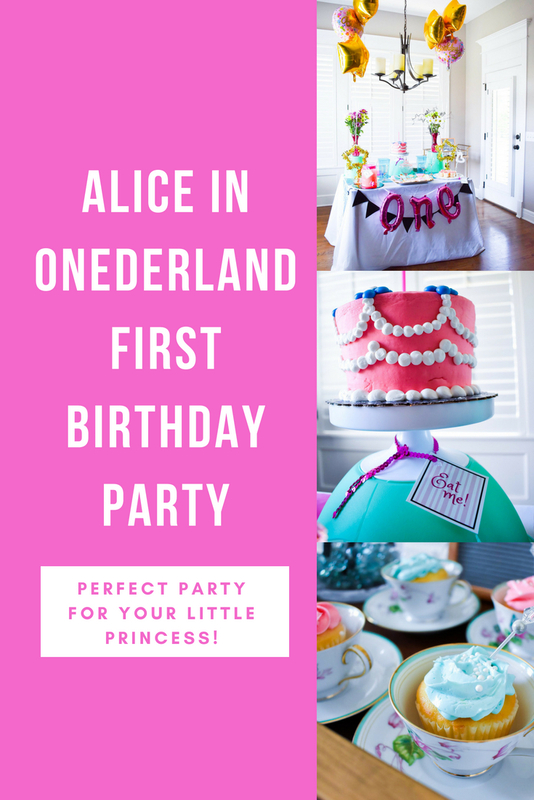 Pin this Alice in ONEderland Birthday Party for later! 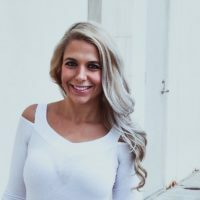 Hey, Happy birthday to your daughter. She is looking so cute. I love her in every single photo. 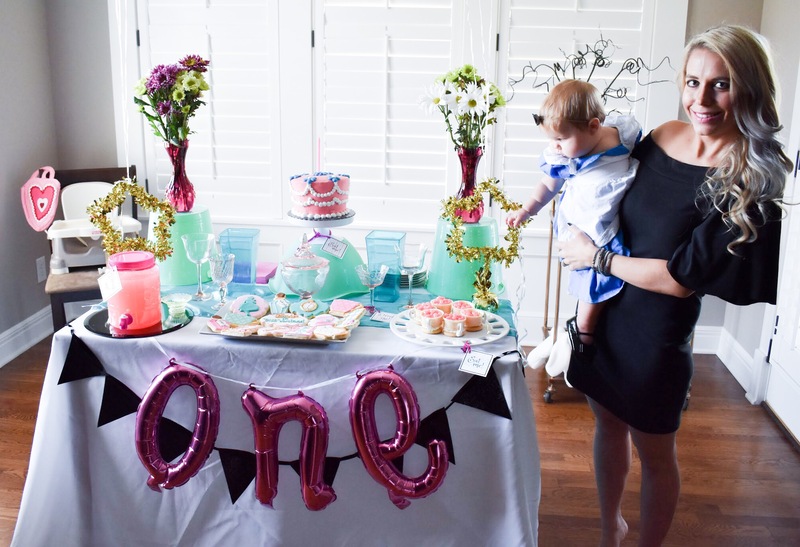 Hope, so it was a grand birthday party. And everyone enjoyed there. Lots of good wishes for your daughter. Thanks for the sharing these lovely moments with all of us.